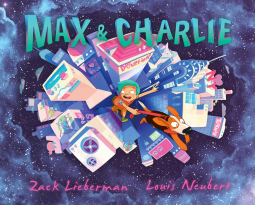 Max and Charlie is a graphic novel for middle graders about the adventures of Charlie, a very imaginative boy, and Max, his unconditional beagle. Max really is very creative and dreamy boy, with a impressive inner world, and he includes Max in all his adventures, for example exploring the universe aboard the SkyFhiter 3030, and saving an important crystal to deliver it to Earth. One afternoon they are having a pleasant time at the park when Max sees a cat. Max chasing the cat, and Charlie chasing Max, they end both in NYC. Charlie doesn't know where his dog is, and his big adventure starts when he wanders around the city trying to find him. Charlie meets many people, and visit many places in an intriguing trip where is difficult to know what is reality and what is Charlie's rich imagination. The art is beautiful, the use of colors wonderful, and the expressiveness of the characters amazing. I think this is a very interesting options for kids and teenagers who enjoy graphic novels and dreamy plots. Sounds good. Wandering around the city can be rewarding. It's a huge adventure for Charlie.